Cook pasta in large saucepan as directed on package, omitting salt and adding vegetables to the boiling water for the last 2 min. Bring dressing, broth and garlic to boil in large skillet. Drain pasta mixture. Add to dressing mixture; stir to evenly coat. Remove from heat. Add parsley, lemon zest and pepper; mix lightly. Reserve 1 Tbsp. cheese. Toss remaining cheese with pasta mixture; top with reserved cheese. 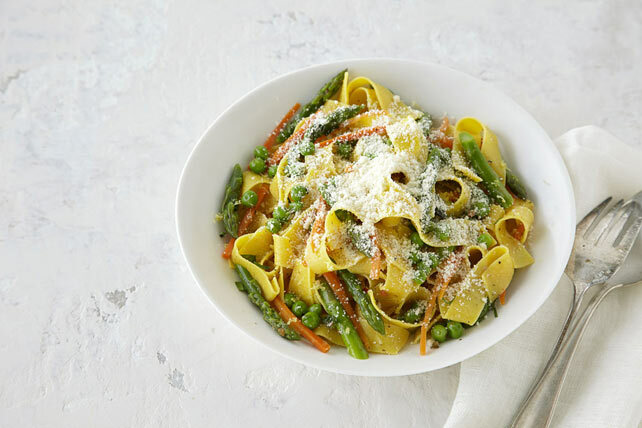 Prepare using regular or whole wheat linguine, penne or farfalle (bow-tie pasta).